Turkish Police Endangering the Lives of Iranian Refugees by sending them Into War Zones! According to news reports from various human rights activists the Turkish police has been involved in transferring Iranian refugees into war torn areas in Turkey where there is armed struggle between an armed Kurdish organization (PKK) and the Turkish Army. A well known Zoroastrian activist and refugee Mr. Farid Shoolizadeh is the latest victim of the Turkish Police and has been transferred to the small city of Sirnak (a city bordering Syria and Iraq) where there is constant armed struggle between PKK and the Turkish Army, not to mention the dangerous of being at the Syrian border! At least four other refugees have also been transferred to war torn areas in Turkey and face grave danger to their lives. Unfortunately this is not the first time we have heard about the brutality of the Turkish Police against Iranian Refugees. In the past the Turkish police has been responsible for assisting Islamic Regime agents in kidnapping of Iranian refugees and their illegal return to Iran, as well as random arrests and beatings of refugees. The Turkish Government has a serious responsibility to protect asylum seekers in Turkey and must make sure that it carries out its obligations to protect asylum seekers on its soil by keeping the Turkish Police in check and making sure they act within the law. PRESS RELEASE: While the Notorious Iranian Prosecutor Saeed Mortazavi has been arrested, other top Islamic Regime Officials are free to Carry out Atrocities Against the Iranian People! Saeed Mortazavi a current senior Islamic Regime Official and the former general prosecutor who was linked to the death of the Iranian Canadian Journalist Zahra Kazemi has been arrested and reportedly transferred to the Evin Prison. The reason for his arrest is not clear however there are some reports that his arrest may be linked to his involvement in the Kehrizak Camps (a brutal detention system where thousands of pro-democracy activists were tortured, raped, electrocuted and killed under severe torture). Sayeh Hassan an Iranian Canadian lawyer, blogger and pro-democracy activists stated: While some Iranian activists both inside and outside of Iran are happy with this new development, it is crucial to keep in mind that the arrest of Saeed Mortazavi is a result of a power struggle within various fractions of the Islamic Regime, rather than the result of any attempt by the Regime to reform itself in any way or to adhere to the rights of the Iranian people. 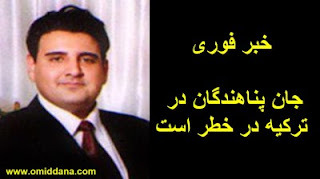 Sayeh Hassan further stated: It is no secret that as of late there has been a great power struggle between the president Ahmadinejad and his ally Saeed Mortazavi and the Parliamentarians who oppose him. With the June Presidential Elections fast approaching, it is not surprising that a power struggle has begin between Ahmadinejad and his rivals. It is important to recognize this for what it is, a power struggle between dictators that has nothing to do with the rights or interests of the people of Iran. Sayeh Hassan concluded: While Mortazavi may be in the “Evin Prison” which certainly won’t be given the same treatment given to political prisoners who are taken to Evin or any other notorious prison in Iran. Even though Mortazavi may have been temporarily prevented from committing atrocities against the Iranian people his counterparts including Ahmadinejad himself and every other senior official within the Islamic Regime is still free to continue to carry out their dictatorship. Until the Islamic Regime is overthrown and all of his senior officials are prosecuted in courts of law for their crimes against the Islamic people, we should be very skeptical and hold off the celebrations about these singular and strategic arrests in Iran.